Who better to teach a course on building natural structures than Kyle Chandler-Isacksen, a former Eagle Rock intern (Fall 1999) who has is a natural builder and urban homesteader? This “hands on” course includes building a Cob Pizza Oven. 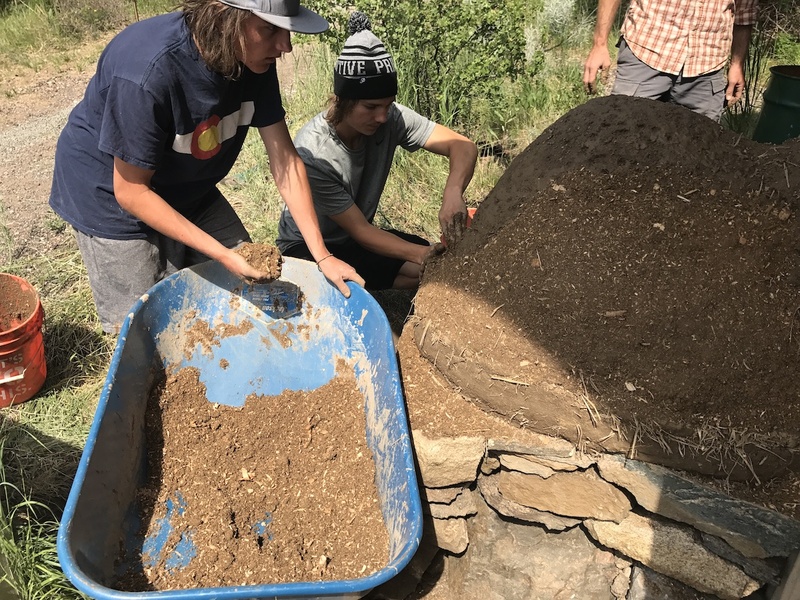 And while that’s not exactly a building, it is a structure and students are learning to use cob (think adobe) and earthen plasters to master the how’s and why’s of natural building. When he’s not building stuff, Kyle who teaches, raises food, and works for climate and social justice in Reno, NV with his wife and family. He has built and led natural building workshops across the country and is dedicated to helping create a more just and life-sustaining society. He and his wife, Katy, met at Eagle Rock 17 years ago as ER-19 Interns. Canoeing and camping along the Colorado and Green Rivers in southeast Utah adds literal meaning to the term Explore Week, with participating students exploring the deep crevices within the Canyonlands National Park. In stark contrast to the hot, sunny desert above, the river corridors are remarkably green, shady and full of life. As of today — Thursday the 29th of June — students are more than halfway through this weeklong canoeing adventure, learning about natural and cultural history, including geology, plants and animals, Anasazi history, outlaws, and more recent human exploration. In this course, students are bringing along songs they’ve started and want to complete or material they have in mind to turn into songs — all in the belief that personal stories make music meaningful to us and to others. 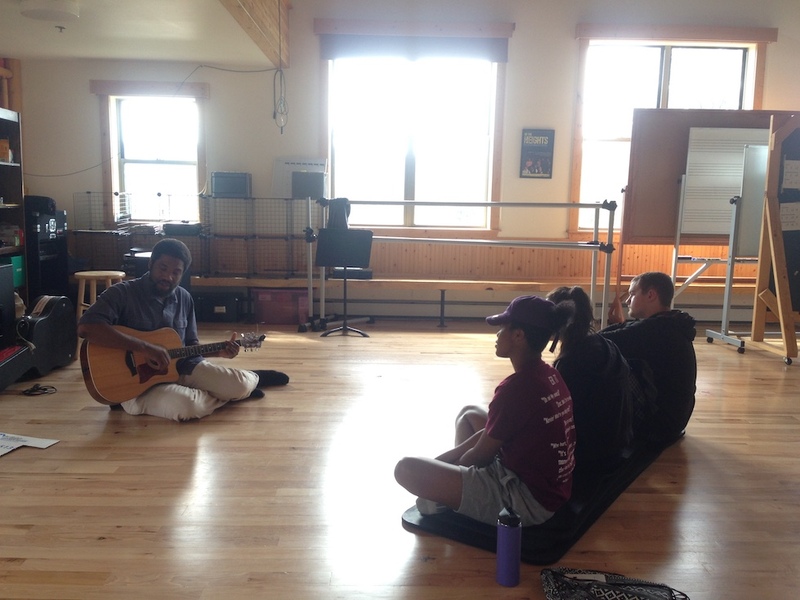 In addition to discussion and writing activities, students are listening to live music performances. Instructors include songwriter and singer Eric Ian Farmer, who has served as an Eagle Rock intern (Fall 1999-Spring 2000) and instructional specialist (Fall 2005 – Spring 2008); and Juan Torres, who teaches concert, jazz and marching percussion within the Estes Park School District, and serves as a Houseparent here at Eagle Rock for Spruce House. The fundamentals of beauty and hair care are taught in this course by a pair of Eagle Rock School grads who use a variety of tools and techniques to enhance beauty. 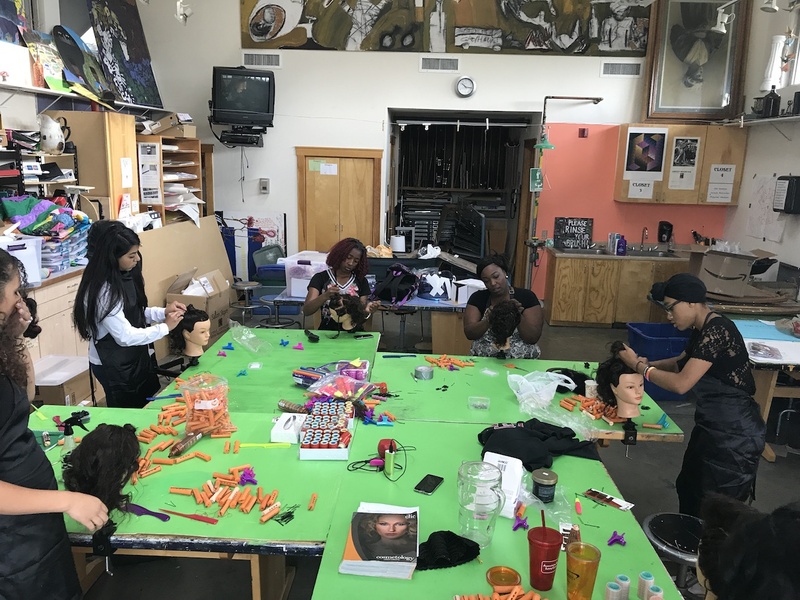 Charmaine Mitchell and Sweets Baldwin are wielding thermal irons, roller sets and flexi rods, teaching students styles such as wig making, sew-ins, twisting, braiding, and crochet. Charmaine is a master cosmetologist from Decatur, Ga., and Sweets hails from New Jersey where she is a fulltime hairstylist for Regis Salon. This course enables students to use photography, mini documentary, music video or spoken word to visually tell a story. Circle training, vision boarding, storytelling, pro-action cafe, and visual harvesting are some of the participatory methods that are a part of this course, instructed by Dario Otero, owner of Youth Lens 360 — a Rosemont, Minn., company that provides visual communication, product marketing, and branding services through the lens of youth ages 14-24. Joining Dario in leading this Explore Week course is Trevonte Marshall, a longtime Youth Lens 360 apprentice who has worked under Dario since his earliest years in high school, creating and teaching video and photography classes while putting to good use his skills as a musician and lyricist. Eagle Rock instructors Bea Salazar (Life After Eagle Rock Instructional Specialist) and Sebastian Franco (2016/2017 Professional Development Center Public Allies Fellow) are taking future collegians on a tour of higher-learning campuses along the Colorado Western Slopes and into New Mexico. Eagle Rock School students on the tour will meet with diversity officers and admissions representatives from the various colleges and universities, including Colorado Mountain College, Mesa University, Fort Lewis College, Adams State University, New Mexico University, CSU Pueblo and the University of Colorado at Colorado Springs. In this workshop, Scott James is instructing students how to get into the writing mindset and then set words down on a page. After focusing on writing, the second half of the workshop involves sharing work with each other and giving and receiving constructive feedback. Here, Scott is offering students some techniques to make them better poets, writers, and spoken word artists. And while we tend to think of poetry as something developed quietly in solitude with a notebook in hand, our Artist in Residence begs to differ. He says the best poetry comes when you’re not really thinking at all and just open to inspiration. This workshop shows students how to capture the good stuff when it comes. This workshop is an extension of Part 1, with students revising their original poetry and sharing those revisions with others for feedback. Then comes coaching and rehearsing for Friday’s open microphone adventure. This is where the rubber meets the road, with Scott and his student charges hosting an open mic in the Hearth (a central gathering space within the Lodge. Students will read their own original poetry, share songs or perform anything they have created — whether from Explore Week or not. It’s a celebration of the creative spirit. This entry was posted in Life at Eagle Rock School and tagged Adams State University, Charmaine Mitchell, Cob Pizza Oven, Colorado Mountain College, CSU Pueblo, Dario Otero, Eric Ian Farmer, Explore Week, Fort Lewis College, Green River, Kyle Chandler-Isacksen, Mesa University, New Mexico University, Public Allies, Scott James, Spruce House, Sweets Baldwin, Trevonte Marshall, Youth Lens 360.